FILE - A clerk counts Chinese yuan and U.S. dollar banknotes at a branch of Bank of China in Taiyuan, China, Jan. 4, 2016. China's currency has been slipping in value since Donald Trump became president-elect. China recently lost its position as the biggest holder of U.S. Treasury securities to Japan. Chinese authorities sacrificed the coveted position, which has significant financial and diplomatic value, because they are engaged in the bigger battle of protecting the value of the yuan from falling rapidly. The battle will intensify in 2017 because the yuan is expected to come under severe pressure during the Donald Trump presidency, analysts say. The country's holdings of U.S. Treasury bonds, notes and bills fell by $41.3 billion to $1.115 trillion in October, according to the U.S. Treasury Department. This was the fifth consecutive monthly drop of Chinese holdings. The amounts of Beijing's sell-offs in November and December will be available next month, but analysts said China continued to reduce its holdings through these months. The sell-off has been prompted by the need to raise funds for defending the yuan, the value of which has been pushed down mainly by capital flight and a strengthening dollar. An official in China's State Administration of Foreign Exchange (SAFE) said the reduction in holdings of U.S. Treasury securities was driven by market conditions and was not a strategic move. "The cutting is not strategic," the official said. "All countries take the U.S. Treasury securities as an important target for their foreign exchange reserve investment, and China is no exception." A strong drop in the yuan's value may signal that Chinese authorities are losing control over the economy, Jacob Kirkegaard, an economist with the Peterson Institute for International Economics, told VOA. "Beijing is desperate to avoid a rapid decline in the RMB, as it would signal a loss of control over the economy," he said, using a widely known acronym for the renminbi, the official currency in China, where the yuan is the basic unit. "Such a signal is likely to cause confidence in the currency, as well as the Communist government, among Chinese savers to drop dramatically." The Chinese currency dropped nearly 7 percent against the dollar in 2016. Ma Jun, chief economist of China's central bank, said the country was confident of keeping the yuan "basically stable at a reasonable equilibrium level." The yuan's slide has been significant, from 6.77 to a dollar in November to 6.94 by December's end. 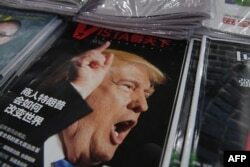 FILE - A magazine featuring U.S. President-elect Donald Trump is seen at a bookstore in Beijing, Dec. 12, 2016. There are strong signs it will slide further if Trump implements his promises about high infrastructure spending, which will further strengthen the dollar. Add that to the potential danger that Trump will make good on his election promise to declare China a currency manipulator. Such action would definitely affect the yuan's prestige, which got a boost last year when the International Monetary Fund accepted it as part of its coveted basket of currencies for Special Drawing Rights — a type of international reserve asset that can be exchanged for freely usable currencies. China might intensify its sale of U.S. Treasury securities in 2017 as part of its reserve management. The new U.S. president is expected to opt for a high level of deficit spending, which might diminish the value of U.S. bonds. "China is trying to avoid a disruptive decline in the RMB and to avoid being caught out with a huge amount of U.S. T-bills just before U.S. interest rates potentially rise fast," Kirkegaard said. "Note there is an inverse relationship between a strong dollar from rising U.S. interest rates (and rock-bottom interest rates elsewhere) and the value of U.S. T-bills and bonds." "In investing in U.S. Treasurys, we take into consideration a package of factors, such as the interest rate hike by the U.S. Federal Reserve and the changes in yields, and based on that, we make dynamic adjustment to our holdings," Chinese media quoted an unnamed SAFE official as saying. "Such an adjustment should not be interpreted as a strategic move." China has seen a sharp decline in its total foreign currency reserves from the peak level of $4 trillion to nearly $3 trillion in the past two years. High reserves helped China enhance its international clout and played a key role in attracting over 70 countries to join the Beijing-sponsored Asian Infrastructure Investment Bank. Analysts are saying China's influence may be affected if the yuan loses value and the country's foreign currency reserves are further depleted. A SAFE official said in mid-December that the level of $3 trillion was "currently adequate." However, analysts said it might be difficult for China to retain the level of reserves if the yuan slipped further. An important reason for the slide in yuan is continuous capital flight from China. High-end Chinese savers have demonstrated a strong tendency to sneak money out of the country despite strong official measures to prohibit it. But if these savers lose confidence in the yuan, analysts say they most likely would suddenly try to get their money out of China, which could make the financial crisis a self-fulfilling prophecy. "China has experienced significant capital flight. What that means is the Chinese are converting their RMB savings into dollars and investing abroad," said Paul Gillis, a professor at Peking University's Guanghua School of Management. "When Chinese convert RMB into dollars, China uses its U.S. dollar holdings to buy the yuan. If it did not do so, there would quickly be an imbalance between buyers and sellers of the yuan, and the value of the yuan would plummet."